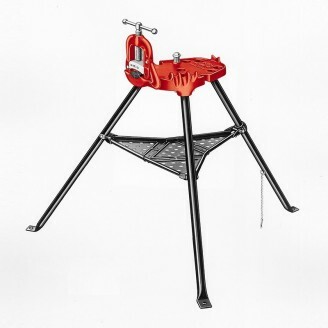 RIDGID 40-A Portable TRISTAND Yoke Vice.Models 460 and 40-A include integral legs and tray folds in for easy carrying and setup. Large vise base overhangs front legs for clear tool swing. Models 460 and 40-A include slots for hanging tools, pipe rest, three-pipe benders and ceiling brace screw. 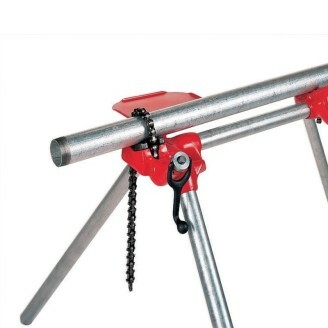 RIDGID 425 Portable TRISTAND Chain Vice. Model 425 features “quick grab” self-locking latch and carrying handle for ease of transport. 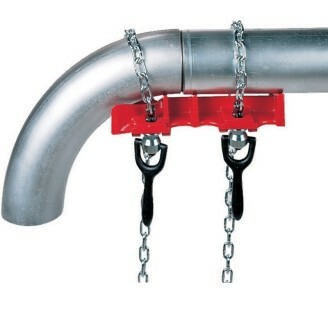 RIDGID 460-6 Portable TRISTAND Chain Vice. Model 460-6 features a larger work surface, 6" (150 mm) diameter, rear support and receding ceiling brace screw. 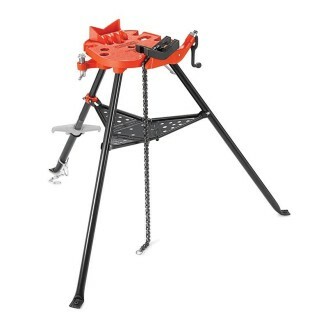 RIDGID 460-12 Portable TRISTAND Chain Vice. Model 460-12 features an integrated ground lug to provide a conductive surface to connect the weld ground. RIDGID BC210 Top Screw Bench Chain Vice.Crank handle anchored to base. Rugged cast-iron base and handy pipe rest and bender. Capacities of 1/8"-2 1/2" 6 - 60mm. Toothless jaws are neoprene-coated to prevent scoring of pipe. 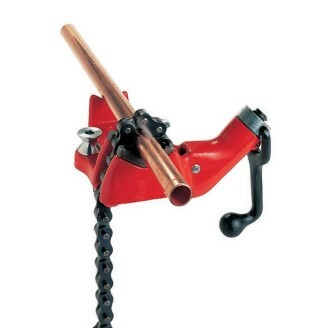 RIDGID BC410 Top Screw Bench Chain Vice.Crank handle is anchored to base. Rugged cast-iron base has handy pipe rest and bender. Capacities of 1/8"-4" 6-100mm. Toothless jaws are neoprene-coated to prevent scoring of pipe. RIDGID BC410P Top Screw Bench Chain Vise.Crank handle is anchored to base. Rugged cast-iron base has handy pipe rest and bender. Capacities of 1/2"-4 1/2" O.D 15-110mm Toothless jaws are neoprene-coated to prevent scoring of pipe. RIDGID BC510 Top Screw Bench Chain Vise.Crank handle is anchored to base. Rugged cast-iron base has handy pipe rest and bender. 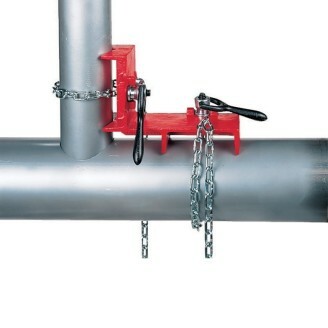 Capacities of 1/8"-5" 6-125mm Toothless jaws are neoprene-coated to prevent scoring of pipe. RIDGID BC610 Top Screw Bench Chain Vise.Crank handle is anchored to base. Rugged cast-iron base has handy pipe rest and bender. 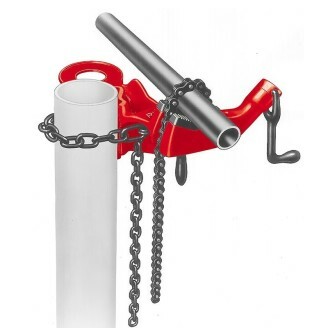 Capacities of 1/4"-6" 8-150mm Toothless jaws are neoprene-coated to prevent scoring of pipe. RIDGID BC810 Top Screw Bench Chain Vise.Crank handle is anchored to base. Rugged cast-iron base has handy pipe rest and bender. Capacities of 1/2"-8" 15-200mm. Toothless jaws are neoprene-coated to prevent scoring of pipe. RIDGID BC4A Bottom Screw Bench Chain Vise. Crank handle is anchored to base. Rugged cast-iron base has handy pipe rest and bender. Capacities of 1/8"-4" 6-100mm. Toothless jaws are neoprene-coated to prevent scoring of pipe. RIDGID 21 Bench Yoke Vise & base made of strong, dependable iron. Hardened alloy steel jaws and convenient pipe rest and bender included. 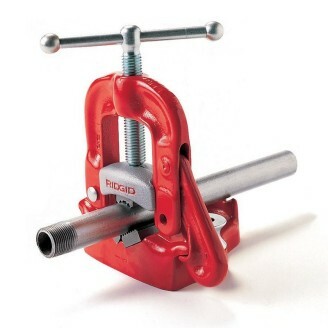 RIDGID 22 Bench Yoke Vise & base made of strong, dependable iron. Hardened alloy steel jaws and convenient pipe rest and bender included. RIDGID 23 Bench Yoke Vise & base made of strong, dependable iron. 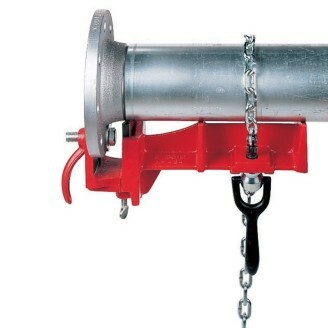 Hardened alloy steel jaws and convenient pipe rest and bender included. RIDGID 25 Bench Yoke Vise & base made of strong, dependable iron. 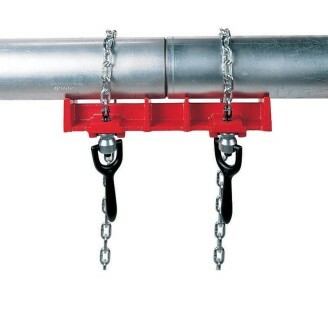 Hardened alloy steel jaws and convenient pipe rest and bender included. RIDGID 27 Bench Yoke Vise & base made of strong, dependable iron. Hardened alloy steel jaws and convenient pipe rest and bender included. RIDGID 39 Portable Kit Yoke Vise. 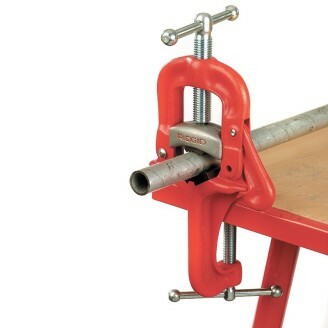 Portable yoke vise easily attaches to plank, workbench or post. 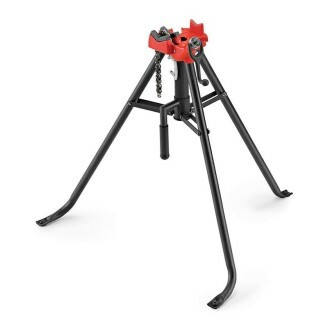 RIDGID 640 Top Screw Post Chain Vise, Light, strong, portable post chain vise fits any shape or kind of post. Model 640 features a tray for oil can, plus a handy pipe bender. RIDGID 461 Straight Pipe Welding Vise, Made of durable performance-proven material and designed to resist strain, heat and warpage during tacking. Machined swivel nuts and pins, together with special chain screws, give smooth and trouble free assembling of the vise onto pipe. RIDGID 462 Angle Pipe Welding Vise, Made of durable performance-proven material and designed to resist strain, heat and warpage during tacking. Machined swivel nuts and pins, together with special chain screws, give smooth and trouble free assembling of the vise onto pipe. RIDGID 463 Elbow Pipe Welding Vise, Made of durable performance-proven material and designed to resist strain, heat and warpage during tacking. Machined swivel nuts and pins, together with special chain screws, give smooth and trouble free assembling of the vise onto pipe. RIDGID 464 Flange Pipe Welding Vise, Made of durable performance-proven material and designed to resist strain, heat and warpage during tacking. Machined swivel nuts and pins, together with special chain screws, give smooth and trouble free assembling of the vise onto pipe. 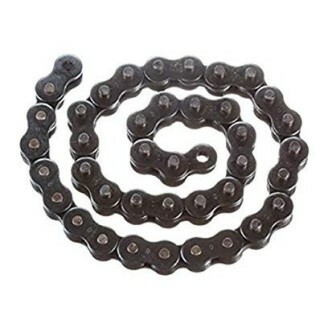 The Model E2783 BC810 Link Chain to fit the BC810 Top screw bench chain vise.